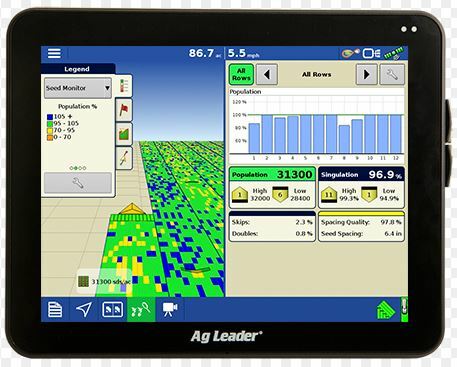 Ag Leader’s SeedCommand system provides complete control over planting operations. With the InCommand 800 display, you can keep up with planting statistics like seed populations/skips/doubles, control up to three planter sections for variable-rate populations, and control up to 48 clutch-shutoff sections. With the InCommand 1200 display, control up to eight products in one pass, produce a reference map of planted varieties that can be referred to at harvest, monitor or control hydraulic downforce across the planter, and utilize the SureDrive electronic motors to maintain planting populations in curved tracks. Thanks to Ag Leader's Hydraulic Down Force system, we got our beans consistently planted in moist soil; and didn't have to replant anything. We probably had a 90 to 95 percent stand on all the soybeans.